Is French Immersion the way to go when educating our kids? My husband and I are continuously debating whether we should send our kids to French Immersion. Being bilingual, with a teacher's degree and having taught in a French Immersion high school, our views may be somewhat biased. I started learning French in grade 9, then majored in Business and French Language & Literature (I know, what a crazy combination!). My love for the French language and culture took me to Paris where I did and exchange program during my third year of undergrad. After that I didn't want to come home, but I did. After my year in Paris I was fully bilingual and landed my first bilingual position at BMO, after completing my undergrad. I later went back to Paris to complete my MBA and ended up staying and working in France for about 4 more years. My parents thought I will never come back to live in Toronto again. Based on my personal experience, I strongly believe that being bilingual in most parts of Canada, especially in major cities is a must. It is an absolute asset that will open many doors for you in the future. On the other hand, my husband believes that French is a useless language and it would be more useful to learn Spanish or Chinese as a second language. French Immersion schools in Toronto start from grade 1, but if your kids are in a private daycare, they will most likely be exposed to learning French from the toddler or preschool years. One day when I picked my 2 year old from daycare, while driving home I hear my son counting in French with perfect pronunciation from 1 to 10. I was so extatic to tell my husband that our son is ready for French Immersion. To my surprise we were not on the same page at all on this subject. After further discussions, debates and research on this subject, I made a list of pros and cons in my head. For instance, one of my friends refused to send her kids to French Immersion fearing they will go away to France and never come back home (as it almost happened in my case). However, in my opinion, the biggest flaw in our French Immersion system is that there is no English until you reach grade 4, i.e. every single subject is taught in French! I know that the rationale behind this is that the children get immersed in French from the get-go, however knowing and learning proper English in the early years is just as important (in my opinion). The acquisition of English skills is the most common concern parents have when it comes to French Immersion. 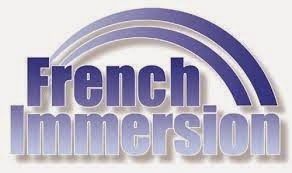 How does French Immersion work? In Ontario, in grades 1, 2 and 3 students receive instruction in French only from teachers who speak French fluently. Beginning in grade 4, time is shared equally between English and French instruction. Students have the option to continue the French Immersion Program in high school. Students must earn at least 10 French Immersion credits to qualify for the French Immersion Certificate upon graduation. 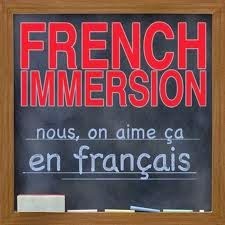 To know more about the French Immersion (FI) Program in the York Region, you may visit http://www.yrdsb.ca/Programs/fi/Pages/default.aspx. The Board of Education believes that although students may lag in English language skills in the first few years, upon completion of elementary grades, students perform just as well as those in regular English public schools. Major benefits of French Immersion include: knowing more than one language is always better and knowing French in Canada always opens more doors of employment down the road. Some believe that French schools are simply better than English public schools and consider them elite as the majority of kids tend to come from higher socio-economic backgrounds with parents having completed post-secondary education. In high school, students are more motivated to stay in FI to obtain their French Immersion Certificate upon graduation and land a better and higher paid job quicker than their English program peers. The level of French fluency will vary from student to student, but most of them will be able to easily converse, read, write and work in French. When I taught FI at Langstaff secondary school (grades 10-12), I was amazed at how fluent most students were. They would easily read and understand poetry, read well known literary fictions and plays, and participate in debates. I remember myself in grade 12 taking FSL (French as a Second Language); I was nowhere close to these students!, and I thought I was amazing. But I also had the opportunity to tutor some of the students from Langstaff whose French teachers were very 'laissez faire' style and didn't provide the necessary support to students, while often embarrassing them in the classroom in front of their peers (a common practice in French schools in France). As a parent, you also have to consider your child's skills, personality and how s/he adapts to the new environment. A friend of mine, who is a FI teacher and advocate of the FI Program did not register her own kids into the FI program. She observed and realized that her son acquired English literacy skills at a slower pace than many of his peers in JK and SK, and believed that putting him into a demanding early French Immersion would only be to his detriment. When choosing the right school for you child (not an easy choice), it is important to consider various factors and aspects, but most importantly you have to remember that while some kids perform great in FI, others may perform even better (and be happier) in a regular English stream class, and vice versa. I'm still a bit torn on this subject and often think that while my oldest son would do great in FI (he is currently learning English, Hebrew and French in daycare), my youngest would be much better off in a regular English speaking classroom. But, then you have two of your kids going to 2 different schools, most likely in 2 complete different locations, which is not easy for a parent to manage logistically. For now, we still have 2 more years to decide. By the way, many parents are not aware, but there are also French schools in the GTA, part of the "Conseil Scolaire Viamonde" (French school board). These are not affiliated and are completely separate from the FI programs. The Conseil Scolaire Viamonde manages the French public schools in Ontario. Their programs are different. The primary language spoken at home (or with your child) should be French or one of the parents had to be educated in French in Canada. I know that these schools focus greatly on diversity and multiculturalism, and success in French of course. You can obtain more information at http://csviamonde.ca/Pages/default.aspx.